Case in point: memes on morality and sin. They are problematic for atheists, though atheists apparently have not realized that yet. Let me explain why. Major premise: If God does not exist, then objective moral values and duties do not exist. I will not expound or defend the argument here, I’ve previously done that in the article The Moral Argument – Revealer of Hypocrites which you can reference for further background. Here let me just note that for many the moral argument is one of the more powerful and persuasive of the arguments for the existence of God because everyone recognizes that we as humans are moral beings with moral obligations. How then do atheists, with all their presumed reason overcome this argument? They use their favorite tactic: denial. This one features the oft-used picture of Leonardo DiCaprio in formal dress, wine glass raised in a toast with a knowing smile on his face. Notice that in addition to assigning the root of morality with humans, not God, there is also an attempt to impute altruistic motives to atheists. An inconsistency in their world view we’ll come back to. “True Morality is doing what is right without the threat of divine retribution nor the possibility of divine reward. Note once again the appeal to altruism. Before providing an individual refutation, let me demonstrate that atheists are inconsistent with their worldview by contrasting these with memes on morality with atheist memes that deal with sin. In the background in this picture is the Holy Bible, implying the writers of the Bible merely invented sin to sell you on its cure: Christianity. So there you have atheist reasoning on morality and sin. Now let’s look at the problems. So if atheists claim they can be moral and do good, then they know the good they ought to do. They also know what is required to avoid sin. If they know what’s required to avoid sin they also know what sin is, because you can’t avoid something you’re unaware of. But how can they avoid something that doesn’t exist? If sin is just “imaginary”, something that disappears in a puff of smoke when you disbelieve in God, how can you avoid it? 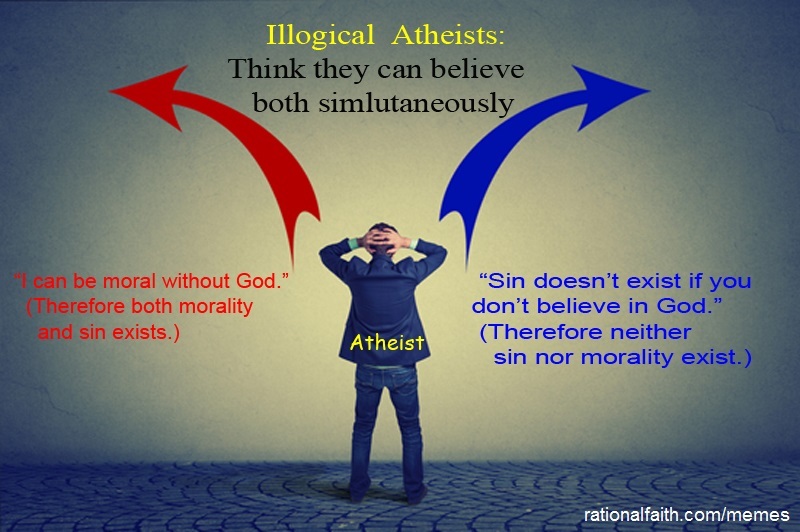 So either sin exists and they can be moral by avoiding it; or sin doesn’t exist, and they cannot be moral because there is no such thing as “morality.” If there is no such thing as sin, and thus no right and wrong, there is also no morality, and thus they can’t be moral people. I noted above an inconsistency with grounding morality in humans. If there is no morality, you can can’t ground it in anything – whether God or humans. 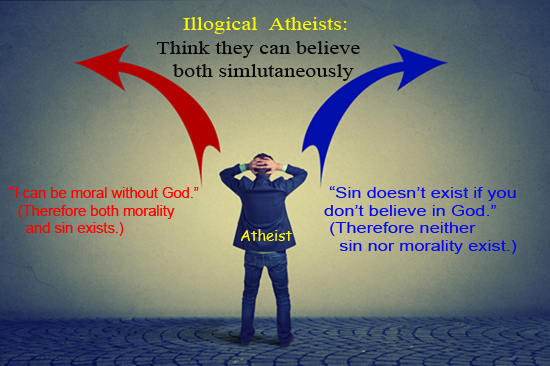 So either both morality and sin exist; or neither morality nor sin exists. They can’t have it both ways – as these memes claim. Thus they must take the approach of no morality and no sin. But that is another inconsistency. If there is “no evil and no good” there can be no morality. So if atheists insist they can be, and in fact are moral people they are denying the required conclusion of atheism: that there is no morality. Furthermore, they are affirming the minor premise in the above Moral Argument for God (that objective moral values and duties exist), thus proving God exists. Another whopping and obvious inconsistency. Even more contradictory, they live as though God exists – even though they deny him. A glaring inconsistency and a clear demonstration that as I’ve stated, you cannot not live consistently within an atheist worldview. If they claim their morality is not based on concepts such as “sin” or “evil” which implies “right” and “wrong” then they’re affirming that there are no moral values or duties, thus they are affirming that “If there is no God…all things are permitted” as Dostoyevsky put it. If that’s true, then if some drug crazed person shows up at their house, ransacks it for money, rapes the spouse, kills the kids, shoots the dog and steals whatever they find of value, then according to their worldview “all things are permitted”, so they have no basis to say anything the criminal did was wrong or immoral. They may not like it, but they can’t say it was objectively wrong or immoral – because according to their worldview – such values do not exist. Now, how many of you believe that if that actually happened to an atheist, said atheist would really be fine with it and believe nothing wrong, nothing immoral happened; that such things are just the universe being the universe? I submit to you they would feel and express the same violation and outrage appropriate to the situation as any other normal human since we are all moral beings; and in so doing once again prove, though they deny God, they live as if he exists. I submit the only people who can really live as if there were “no evil and no good, nothing but blind, pitiless indifference” are psychopaths. And such people we lock up and keep away from society once the results of a lack of recognition of good and evil is made manifest. Atheists by definition do not believe in God. And by extension, they do not believe in a non-material realm – no angels, no demons, no heaven or hell, nothing outside of the material realm. If that is true then “morality” does not exist, because morality is a non-material concept. According to atheists, such non-material things do not exist. If morality does not exist, why are they trying to live according to it? If we’re really just molecules acting according to the laws of physics (determinism), what do values and morality have to do with anything? Does your toaster care about morality? Obviously not. According to atheists, we have no more of a soul than a toaster. So why care about morality? 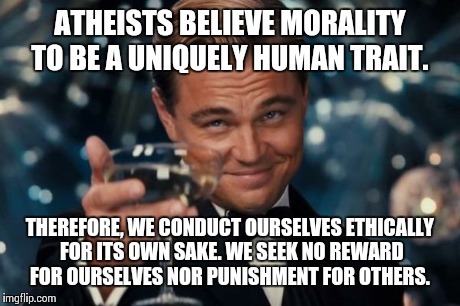 We’ve already seen that to be consistent, they can’t claim they want to be moral because they want to be “good” because according to atheism, there is no good, and no evil, no right and no wrong. So what’s the point of trying to be moral? People in their right mind don’t try to emulate the morality of their toaster. Why? Because a toaster has no morality. It cannot be moral. By the same token if we are mere material beings, we can be no more moral than a toaster. Christians believe in a soul, and a holy God who created a universe infused with his morality. Thus it makes sense for the Christian. But for the atheist it makes no sense. Some atheists will say they try to be moral because they don’t want to be caught doing something society considers evil and go to jail. Okay, that just means for the atheist, you do your evil so as not to be caught. There is no existential, no ontological reason to be moral and do what’s right: No holy God you’ve offended (Ps 51.4), no living soul (Gen 2.7 KJV) you’ve harmed. No objective value you’re trying to uphold. There’s just a collection of molecules you’ve interacted with, and if you do something considered “wrong”, you don’t see it as wrong, you merely have a practical desire to not be caught for what you’ve done to the victim. Thus the honest atheist should state, “I don’t believe morals or morality exist, I do what I please but I live a moral enough life to stay out of jail.” That statement in itself proves that morality is inconsistent with an atheist worldview. What are atheists saying when they state “sin does not exist”? Are they saying that evil and wrong doing don’t exist? Clearly not. 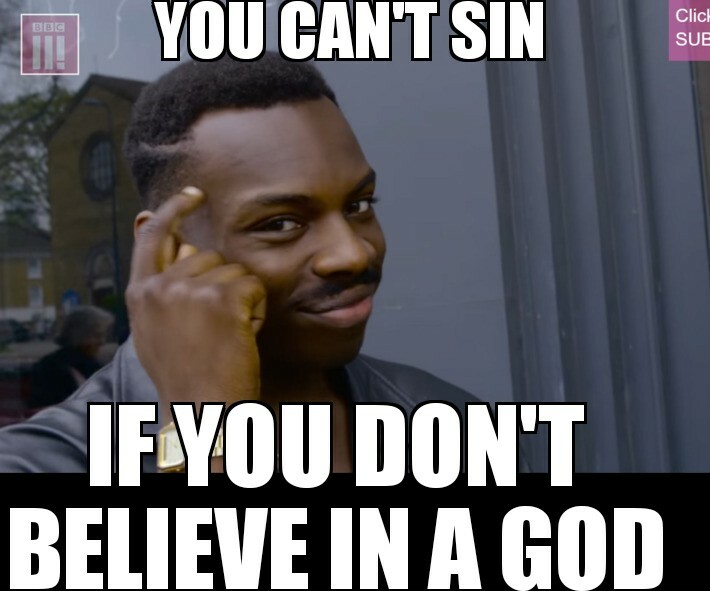 The first reason, as I pointed out above and as this meme (which shows an atheist who claims sin doesn’t exist, but locks his doors at night) points out, atheists actually live as if sin does in fact exist. The second reason they’re not saying sin itself doesn’t exist is the problem of evil is for many atheists (and even non-atheists) one of the biggest problems people have believing God exists. (Need I point out that if there is evil, a being with freewill had to sin to commit the evil act. Your toaster can’t sin.) The challenge is, if there’s an all powerful, all good God, why is there evil? Why doesn’t he eliminate it? The short quick answer is, if God eliminated all evil right now, there would be no one left on earth. (Mark 10:18). And it has always been God’s purpose to harvest his people out from the wicked, not simply just destroy all people. (Matt 13.41) So the claim that “sin doesn’t exist” – logically cannot mean that sin, and thus its results (evil) do not exist. Clearly evil does exist. Every security measure an atheist takes proves it. What then are atheists talking about? Since they are not referring to the obvious results of sin (evil), they must be referring to the unseen results of unforgiven sin. Indeed it appears what atheists are really denying, is the results of unforgiven sin. As I pointed out in Hell is for liars the results of dying with the unforgiven sin of believing there is no God (which is a lie), is an eternity in hell. Atheists don’t like that thought so they simply deny it. And in so doing they’re really just re-stating what we already know about them – that they deny the existence of God – and what God has clearly said. It’s not really surprising that those who deny the existence of God also deny the punishment of God upon those who refuse to repent and believe. That, my dear atheists, is the truth known as the gospel. Believe it or not at your own peril. This entry was posted in Answering atheists, Apologetics, Atheism, Atheist Memes, Bible, Gospel, Hell, Jesus The Messiah, Meme Mistakes, Morality, The Moral Argument, The Problem of Evil and tagged Richard Dawkins by Duane Caldwell. Bookmark the permalink.